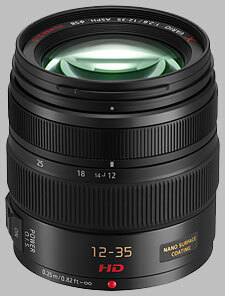 Panasonic announced the 12-35mm ƒ/2.8 ASPH POWER OIS LUMIX G X VARIO zoom lens in May of 2012, offering the equivalent of a 24-70mm (in 35mm film terms) ƒ/2.8 zoom lens for their micro four-thirds camera bodies. The lens offers a constant ƒ/2.8 aperture across its range of focal lengths. The lens was designed for the micro four-thirds mount, and thus will not mount on other four-thirds camera bodies. It should however mount on other micro four-thirds bodies, such as those produced by Olympus. The lens uses 58mm filters, and ships with a petal-shaped lens hood. At the time of writing, we have no pricing information. Please note we tested a pre-production version of this lens, so results from a production version may be different when the lens hits the market. The Panasonic 12-35mm ƒ/2.8 offers very sharp results, consistent across all focal lengths. The lens offers almost tack-sharp performance when used wide open at ƒ/2.8, with only a bit of softness in the extreme corners; stopping down to ƒ/4 provides solid edge-to-edge sharpness. In fact, ƒ/4 seems to be the optimal aperture for this lens, as results actually degrade very slightly when the lens is stopped down further than that. This is all very relative, though - results are still extremely sharp from ƒ/5.6 through to ƒ/11, with diffraction limiting only becoming practically visible at ƒ/16. At ƒ/22, we noted some light softness across the frame. The lens offers excellent resistance to chromatic aberration. If there is any to be noted at all, it appears most at the wider end of the lens' zoom range - 12mm - and is quite subtle, appearing as magenta fringing on areas of high contrast. It shows up only in the extreme corners. At other focal lengths and apertures, it is very hard to notice. The Panasonic 12-35mm ƒ/2.8 does exhibit some light corner shading when used at its 12mm focal length across all apertures, and when shot at ƒ/4, just at 12mm. The numbers are very small - at its worst case scenario (12mm at ƒ/2.8), you're looking at extreme corners which are a half-stop darker than the center of the frame. At other settings, there is less corner shading to note, if any at all. For a zoom lens, there is very little distortion at the wide end, which suggests to us that there is probably some post-processing going on in the camera to lessen the effect. Barrel distortion is very light when used at 12mm, hardly noticeable at all, and between 18-25mm, there is no distortion at all. At 25mm-35mm, there is some noticeable pincushion distortion in the corners, but it is not overwhelmingly obvious. The 12-35mm ƒ/2.8 X offers very fast autofocus results, motivated by an in-lens electrical motor that's very fast and very quiet. Filters attached to the front element of the lens won't rotate, making life a little easier for polarizer users. The lens isn't a dedicated macro lens, offering only average results for macro - just 0.17x magnification, with a minimum close-focusing distance of around 9 inches (25cm). As with most micro four-thirds lenses, the Panasonic 12-35mm ƒ/2.8 is quite small, and comparatively light - it weighs just 305 grams (just 10 ounces). The pre-production version of the lens we tested is slightly red in its coloring, but we have been told by Panasonic that the shipping version will have the customary black-grey coloring of their lens lineup. The lens mount is metal, and the 58mm filter threads are plastic. The lens also offers a rubber grommet at the mount end for protection from water and dust. The zoom ring is the larger of the two, a thick rubber with raised rubber ridges. It is 7/8'' wide and is mounted closer to the lens mount. The lens doesn't have any problems with zoom creep, and the zoom action is nicely cammed, providing a smooth turn that has just the right level of firmness. The focus ring is composed of plastic with raised ribs, and is 3/8'' wide. The focus ring will turn forever in either direction, with no hard stops to indicate a focus limit. Thus it's hard for us to determine how many degrees of ''focus action'' are available in manual focus, though manual focus is handled extremely well by the camera. Panasonic has built Image Stabilization into the lens, useful for countering the effects of shaky hands holding the camera. Unfortunately our limited time with the lens didn't allow for us to conduct our usual IS testing. The H-HS12035 lens hood that ships with this lens is a small petal-shaped hood which attaches to the end of the lens via a bayonet mount. The hood is 1.5'' in length and can be reversed onto the front of the lens for easy storage. At the time of writing (May 2012) lens options for micro four-thirds users have been fairly limited, with only Sigma starting to roll out some off-brand alternatives. When it comes to the 12-35mm ƒ/2.8, it's the first of its kind, and there really isn't anything else in its category. There's not much to add to this review that the numbers don't already show - the pre-production version of the Panasonic 12-35mm ƒ/2.8 that we tested showed excellent performance across the board. In addition, it boasts image stabilization and a splash- / dust-proof design: there is a lot to like here, making it an attractive upgrade for GX-1 users. The only unknown will be the price, which we're sure can't be cheap for a lens this good. Smooth operation and superb build quality and although the body will dinged and scratched easily with mild use, I much prefer a quality plastic exterior, my Oly 45mm 1.8 looks brand new after 2 years of heavy usage, this lens does perform really well in low distortion (with correction), great corner to corner sharpness at f4 and above, and excellent control over CA overall. It is an expensive lens for this category of camera, but it does put the E-M5 into a professional level with this and the 45mm F/1.8. I've already begun using this lens professionally in my work and very satisfied with the results. OIS is a plus over 12-40 2.8, although I don't need it now with E-M5, but you never know when you will be moving on to GH4 :). What's not to like about a sharp constant f/2.8 OIS zoom that weighs 300 grams ? SLR Gear's review matches my lens' performance exacly, and mine is a production lens, a grey import from Japan, with a slightly pearl-black-purple finish. The OIS is very effective but adds a momentary delay in AF when it activates. No big deal but worth mentioning I think. After 2 years use, I sold it. I found the 14-42mm II to be just as sharp, and although it's 2 stops darker, I don't actually miss the brighter aperture because I was always stopping down to f/5.6 for maximum MTF. I also don't miss the dof control because I switch to f/1.7 prime for that. Its the best micro-43 lens I have had in my hands. Although my name is Prime Minister, I do appreciate a good zoom lens with a useful zoom range and a fixed fast aperture. Kit lenses of course can be a great alternative if your on a tight budget, but they can't beat a high quality zoom like this. The Panasonic 12-35mm certainly caught my attention. Given it's professional (high) price, my expectations were high. The lens did not disappoint. The build quality is very good. The lens has a good quality feel to it and everything works quick and accurate. I expected the zooming to be a little bit smoother, but it's really good as it is. Maybe it gets smoother over time. The lens extends a little when zooming in. I wish the extending lens tube was metal like the lens barrel. Also, I'm not a fan of the super shiny bling bling finish of the lens barrel. These are just trivial things of course. The 12-35mm has a nice weight, but I think the lens feels a bit too heavy on smaller micro 4/3 camera's like the olympus PEN Mini. On a camera like the Olympus OM-D it feels just right. It provides a good grip and it prevents camera shake. The plastic petal shaped lens hood locks on quickly and firmly without any play. The lens hood is relatively small when you compare it to the lens hood of a Nikon 24-70mm f/2.8. But then the whole lens is incredibly small and light for a 24-70mm (equivalent) f/2.8 lens with image stabilization. Amazing. The image stabilization works great and it permits at least a two to three stops slower shutter speed. The autofocus is quick, silent and accurate in most conditions. Continuous autofocus is not so great, but since I never use it, that's no problem for me. Also, this is probably not a shortcoming of the lens but of the camera autofocus system. The 12-35mm focusses rather close and that's something I always like. It gives the photographer the possibility to isolate a subject and zoom in on details. Okay, let's pixel peep. Sharpness in the center is excellent at all focal lengths straight from the widest aperture. The corners are a tad soft, but they sharpen up by stopping down one or two stops. At f/2.8 the image quality is very good. Set it to f/4 and you don't have to think about it at all. I see no problems with the contrast and colors either. There is some CA, but that can be removed easily. 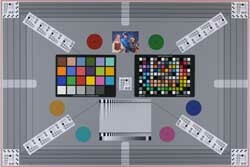 The image quality is not as good as some of the best primes, but to me it's more then acceptable. It comes very close. Really good performance and I expected no less. It depends on your style of photography (and budget) if this lens is interesting to you, but I think this is a very high quality zoom lens with a useful range and a fast(ish) f/2.8 aperture. It's very convenient to go from 24mm wide angle to 70mm short tele in a twist of the wrist without any serious compromise on image quality. 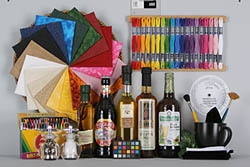 All of this comes in compact, lightweight, weather sealed and high quality package. Great for journalistic/reportage photography or as an everyday do it all lens. Would I recommend this lens? Yes, go get one! And some primes. Update (12-2013): There is a new king of the hill: the Olympus 12-40mm and I like it better then this Panasonic. Read my review and find out why. Its the best micro-43 lens I have had in my hands. Using a fast lens and image stabilization could help you leave your tripod at home. Which is a good price for waht you get. You will enjoy the image quality and forget what you paid for it real soon after purchase.